A workhouse was in operation in Bourton-on-the-Water by 1783, in a property rented by the parish (Elrington, 1965). The running of it was contracted out from 1787, but its use had ceased by 1803. The parish also made use of the "roundsman system" where ratepayers were obliged to find work for able-bodied paupers with the poor rate contributing to their wages. In the years 1830-33 twelve poor families were assisted in emigrating to North America. In 1834, the Vestry decided to refurbish the building then in use as a poorhouse and to reopen it as a workhouse. A small workhouse was also in use at Bledington. County of Gloucester: Adlestrop, Great Barrington, Bledington, Bourton-on-the-Water (2), Broadwell, Clapton, Condicote, Donnington, Eyford, Icomb, Church Icomb, Longborough, Maugersbury, Naunton, Notgrove, Oddington, Great Rissington, Little Rissington, Wick Rissington, Sezincote, Lower Slaughter, Upper Slaughter, Stow-on-the-Wold (2), Lower Swell, Upper Swell, Westcote. County of Worcester: Daylesford, Evenlode. The population falling within the union at the 1831 census had been 9,105 with parishes ranging in size from Sezincote (population 51) to Stow itself (1,240). The average annual poor-rate expenditure for the period 1833-5 had been £4,682 or 10s.3d. per head. 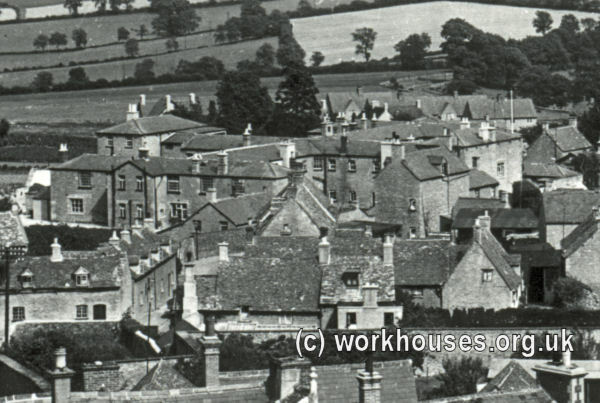 Stow-on-the-Wold workhouse — distant view, 1930s? By the 1920s, girls at some workhouses joined the Girl Guides. A 1924 picture (below) from Stow on the Wold is captioned "Rangers and Girls from the Institution" (Rangers being the senior branch of the Girl Guides) indicating that there was some kind of involvemeny between the Guides and workhouse girls. 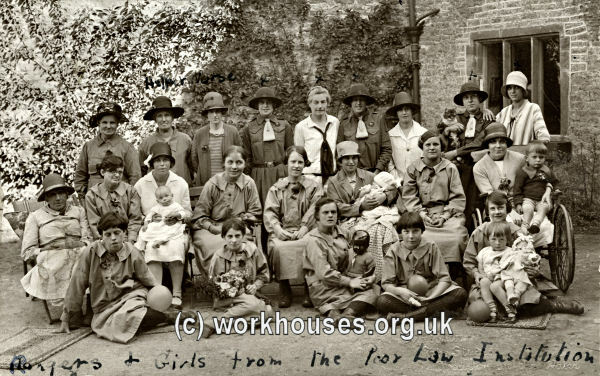 Stow-on-the-Wold workhouse girls and Girl Guide Rangers, 1924. After 1930, the workhouse became the East View Public Assistance Institution and later an elderly care home. The building has since been demolished and a residential care home now occupies the site. Gloucestershire Archives, Clarence Row, Alvin Street, Gloucester GL1 3DW. Holdings include: Guardians' minute books (1836-99, 1903-15, 1920-24, 1927-35); Ledgers (1846-30); Workhouse specification and plan (1836).